I was born in India and was born a Catholic, which was odd. My grandparents were born in Mangalore, a town converted by the Portuguese in the 16th century. My childhood, I guess, could be summed up in two words: “reading,” a lot, precociously, and “mischief”. I was known as the naughtiest girl in the school and was expelled from my first school, aged 8. I then went to a Catholic boarding school run by Irish and German nuns, St. Mary’s Convent, in Nainital, a beautiful pristine hill-station in the Himalayas. It gave me a solid academic foundation. The nuns required almost the same devotions of us as of themselves: daily Mass; Benediction: a cascade of hymns every Sunday evening; Adoration: silent prayer before the “Blessed Sacrament” every first Sunday; Confession, Rosary, and choir-practices. The other highlight of school was my relationship with Sister Josephine, an Irish nun who invested in me, and said she loved me best of all the girls she had taught over the last 40 years. She would get me books from the nun’s library or the senior classes, train me in elocution, and discuss Scripture with me for hours, because I had dozens of sceptical questions. She was an Irish Protestant convert to Catholicism, and I think I absorbed a Protestant world view (the centrality of Jesus) from her. She quietly ignored all the add-on aspects of Catholicism (the dear departed in purgatory, saints, rosaries, novenas, making it easier to shed them later). I was rebellious, an atheist, “the naughtiest girl in the school”, but after a sudden conversion experience decided to enter Mother Teresa’s convent and become a nun. It followed the ancient Benedictine model, a mixture of work and prayer. Since I was still in training, we spent mornings in classes on theology, Scripture and their constitution, and in prayer. We worked in Mother Teresa’s homes in the evenings– in the home for dying destitute, orphans, and the mentally handicapped. (I’ve written about my work at Kalighat, the home for dying destitute in Zaleski’s Best Spiritual Writing series. The recitation of the Liturgy of the Hours–laud, none, vespers and compline, a melange of psalms and traditional prayers–ring-fenced the day in prayer. In addition, there was Mass; an early morning half-hour of silent meditation on scripture; an hour of “adoration,” or contemplative prayer; and a half hour of spiritual reading. A total of 3.5 hours in various spiritual activities. I did gain much familiarity with Scripture, which has been a blessing to me. When I was there, 1979-1980, it was a young religious order, and eccentric, shaped by a visionary, who was revered, and apparently unquestioningly obeyed. One of her dearly-held ideas was that one needed to voluntarily share the hardships of the poorest of the poor to have empathy for them. The deliberate quest for extreme poverty meant that we were put 25 to a room, and there was a constant time-consuming shifting and re-arranging as the room became a refectory, a classroom, and a dormitory. The food was simple, and nutritious enough, but, another peculiarity: there were large fixed quantities one had to eat, which were quite extreme: 5 chapatis for breakfast, and five ladles of rich for lunch and dinner. After a couple of her sisters caught TB on her original diet of salt and rice, rice and salt, she imposed this as a safeguard against disease. Everything, even the pettiest details–subjects to meditate on as one dressed, mending sarees from thread unravelled from scraps, eating the skin of papayas– was controlled by rules. It was high-control, almost like a cult, legalistic and judgmental. After a while, it becomes easier not to think for yourself, and instead do whatever would get you praised, or avoid what would get you judged. We slept at 10, and woke at 4.40 a.m. for church, with a half hour mid-day nap. Since I was 17 when I joined, I was perpetually tired and felt constantly sleep-deprived. Sleep deprivation (used by cults, and authoritarian systems: labour camps, prisons) makes it easy to go along with authority and not question. My first thought on waking and predominant longing was for naps and bedtime. It wasn’t sustainable. The first three years were a kind of boot-camp, deliberately harsh. The novice-mistresses had complete power over us (one of the vows was obedience) and I struggled with perceived injustice, and the authoritarianism with no recourse of complaint. The nervous intensity of prayer, and scripture study and meditation can ironically heighten irritability, and the rub of community life 24/7 with 25 people sharing a medium sized room. Two people had breakdowns when I was there. One just sat and giggled helplessly. Another was sent home and attempted to jump out from the bars of the train. Leaving the convent once you join was viewed as disgraceful in Indian Catholic society. Eventually, I saw an image of myself in a train going ever further in the wrong direction, but afraid to get off for fear of looking foolish. I conquered my adolescent fear of looking foolish and asked for permission to leave. And, in fact, my health was shattered, though no one realized this while I was in the convent. I returned home, deeply exhausted, and within the month was diagnosed with both early stage TB and hepatitis! An Autobiography in Blog Posts: IV. Oxford Redux. Thank you so much, Na Pan, for your kind and sweet words!! That is an engrossing read, and to sum up your life's high and low points so succintly must have been quite a task. 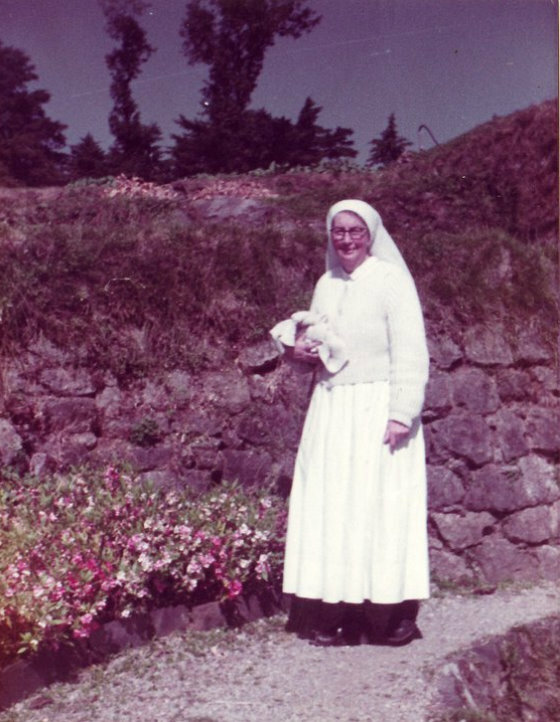 Sr Josephine was a much loved soul. I remember the song in her voice when she came with you to our class telling us you were joining Mother Teresa's convent. At that time I really wondered how could you, just a few years older than myself, take so seeingly harsh a decision . Even today I can recall the moment and the feeling exactly. Now wiser , by reading through your blog, and with a little experience garnered over the years, I must say , I admire you all the more. Thank you Anita, for putting all this out for us to read. keep writing, and be blessed always. Wow! This is absolutely amazing. There is so much here to think about. I must stop as I am due to hand in an assignment (!) but i can't wait to continue reading. No, I didn't know that. After Jo in Little Women? Praising God for the amazing Sister Josephine and the impact she clearly had on your life. I think I've told you my younger daughter is named Josephine?